After a lot of talking and legislating, Vladivostok and most of the populated areas of Primorskiy Krai will now be granted ‘free port’ status for 70 years, promising tax benefits, a reduction in bureaucracy and paperwork, and visa free possibilities for tourists, amongst other things. The changes won’t happen immediately – it’ll likely come into force from 2016 – but local politicians and ministers are excited about the possibilities, with talk of a threefold increase in regional GDP and an end to the continued – albeit now at a relative trickle – of outward emigration if all goes to plan. In this article I’ll take a closer look at the announcement, and discuss whether this is the huge boost for the region that it is portrayed to be. First up though, a little bit of history. The initiative isn’t a new one for Vladivostok; over 100 years ago the city had a bustling port connecting Russia to Asia and beyond. Legislation in the early 1860s had given Vladivostok the status of porto franco, though for Vladivostok it was not simply in the sense of supplying the region with foods and materials, but also as a transit point for goods to enter and leave the rest of Russia. This continued until the turn of the century, at which point the construction of the Trans-Siberian railroad, and political desires to keep Vladivostok closer to European Russian markets, saw this status rescinded. The status was reinstated in 1904, but once again was removed in 1909 to reduce the strong economic influence Japan had been gaining in the region. Delegates from the east continued to push for even just a ‘free port’ status rather than a full-blown porto franco, but the beginning of WW1 put an end to those discussions, and the Soviet era saw a complete closing off of the city. In some regards then Vladivostok isn’t embarking on a new initiative, it’s reverting closer to what was its natural status for half a century. I say closer because it’s not quite the same, and doesn’t go as far as the two earlier periods of porto franco. This is one of the clever perceptions given out by recent announcements, as there is the impression that Vladivostok will now be a completely open market, whereas in reality there are restrictions and technicalities that come into play. For example, companies which want to take advantage of these benefits must go through a long administrative process to be approved as resident, and they can’t already be taking part in regional investment projects, nor can they be based in or hold offices in other regions. On the positive side, bureaucracy will be handled by one solitary government agency, which will do any legwork with other agencies that you need beyond their services, and being a resident will offer further legal protections and representations than before. This is one aspect we’ll really need to give time to see if it performs to the benefit of residents. But what other concrete benefits will there be? Companies operating in the zone will pay a flat rate of tax at 5% instead of 20% for the first five years, and in the next five years at 12% (or no less than 10%). Payment taxes to non-budgetary funds will be reduced down to 7.6% from the current rate of 30%, property tax will be exempted, and direct state aid can be sought for infrastructure investment if the majority of funds come from the company themselves. These are all positive steps for the promotion of business development and investment, but it remains to be seen if encouragement is given on top of this to native companies and start-ups, rather than just a carrot dangled in front of foreign companies. The port will also have five very distinct zones with each focusing on certain goals; a port and airport zone, an industrial zone, a scientific zone, a tourist-recreational zone and of course the impending gaming zone. The focus appears to be on developing shipbuilding and repairs, manufacturing, export-oriented and import-substituting industries, some agriculture, and of course tourism. This makes it look a lot closer to the parallel plans for areas of advanced development, or TOP, than as a free port. There’s no doubt that the region could do with a boost to its shipyards considering the pressure put on them by the good work done in places like Korea, but it should ensure support is available for all industries, not just a select few. A further promise that ties in with these zones is that of greater infrastructure investment by the government. If you’ve been to the region, you’ll know it needs it. The better they can connect the parts of the region together, and to neighbouring regions, the more companies will be able to utilise a larger distribution area, something that is lacking at the moment. A final promise in the law that caught my eye is that a special ‘Freeport’ area will be set up the region. Not to be confused with ‘free port’, this is basically an area where goods can be sold duty-free, expensive and luxury items can be stored for use in presentation to potential clients and investors, and generally a contained area for getting around some of the aforementioned restrictions placed on the ‘free port’ status. It seems to work well in various countries in the world, and will probably be a popular destination when the law kicks in. It would be prudent however to highlight that Nakhodka had already been given a special economic status for a number of years now, so in some ways the region has already had contemporary experience of a ‘free port’ area. Whilst Nakhodka is one of the better cities in the region, it isn’t an economic miracle nor is the administrative process superior to the rest of the country, not to mention previous contemporary Russian experience with special economic zones has hardly been positive. In the past it would almost seem that Russia created these zones and expected the magic to happen by itself –like they’d seen ‘Field of Dreams’ one night and took it literally when Joe glances towards home plate and says “If you build it, he will come.” For this reason it is hoped that the planners and politicians have done a bit more homework than in the past. Yuri Trutnev has said they’ve worked on this for a long time, visiting many Asian free ports, learning from their legislative and bureaucratic changes, and generally educating themselves about how to get the most out of a free port. They still have some months to iron out any wrinkles in the plans, meaning they really have no excuse for not being prepared and giving the project the best chance of success. Hopefully Nakhodka will also finally benefit from a ‘free port’. Overall the plans given out already are a bit on the vague side, but for the money men there will be opportunities to get more familiar with the processes. Between the 3rd and 5th of September the Eastern Economic Forum will be held in Vladivostok, at which there will be meetings with potential investors to go over the plans in further detail. It’s only after occasions like these we’ll really get to hear the feedback and thoughts of the people who can make or break the plans for the city. Needless to say, progress will also be monitored closely by the federal powers back in Moscow; a lot of money and leeway has been afforded to Primorskiy for this initiative, and any failure will see a few of those at the top lose their position. But in the end, can the ‘free port’ be all that Primorskiy hope it can? I asked some residents for their views on it, with opinion varying. A few aren’t particularly interested in the proposals or don’t see it as making any difference to their business situation, but for others there’s hope. One resident lamented that local business likely won’t see much benefit and that this is firmly aimed at foreign investors, but despite this would still produce more jobs for people, something important for retaining residents instead of seeing them move away. Another recognised the positives and negatives; it doesn’t reach the porto franco status many would want, but at the same time it’s a change and a breath of fresh air, a chance to experiment and either succeed or learn from the mistakes. Others simply wait with an open mind to see the implementation and reality rather than speculate on how it will play out. And one final comment opens up some potential negatives for areas outside of the city of Vladivostok – a free port means more military ships moved from the city to smaller towns nearby, potentially polluting beaches and swimming areas beloved by locals. It remains to be seen whether the hope and optimism is a good thing, or setting themselves up for another disappointment. And what do I think of it all? There are free ports in almost every sea-facing country in the world, and for every success there is an underwhelming case story. However, I don’t think Vladivostok should try to become the Russian version of San Francisco or anywhere else – it just needs to be a better and more successful Vladivostok. The city has always had a love of the sea; it’s a core part of the culture and identity of the people who live there, a real feeling in their hearts. Invoking that history of a time when Vladivostok was a world-renowned port will inspire a large group of people and give them a vision for the future of the region. On the other hand, those dreams don’t take into account something that more famous port cities have taken advantage of, something that Primorskiy doesn’t really have in this day and age – favourable geography and a prime location on natural trade routes. Places like Suez and Panama are world-famous, and territories such as Singapore, Hong Kong, Busan, Macau and Tokyo do very well for themselves. Gibraltar, Lebanon and Monaco are not to be sniffed at either, and up until the western world got involved, Libya enjoyed many benefits from its free port area in Misrata. All of these had those natural benefits of location, whilst Vladivostok’s selling point in recent years is as a starting point for the Trans-Siberian railway, or the Northern Passage, both of which are not looking as popular for freight as they had seemed a number of years ago. 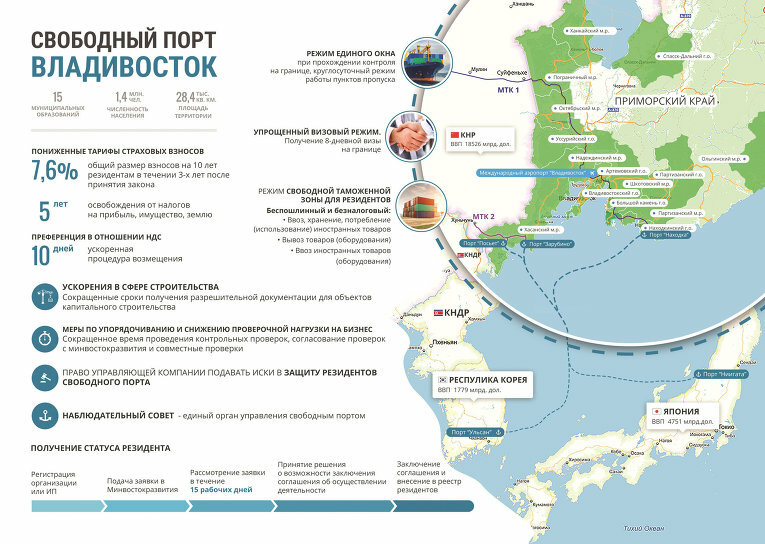 For these reasons, Vladivostok will have to find other ways to stand out and create a compelling narrative if it wants to make a real success of the restored ‘free port’ status. This entry was tagged Development, Владивосток, Дальний Восток России, Приморский, Развития, Россия, Свободный Порт, Free Port, Primorskiy, Reforms, Russia, Russian Far East, Vladivostok. Bookmark the permalink.